The Rawah Crew had a week full of problem solving and new projects. On Sunday, we went out on the Roaring Creek trail expecting to camp out for a night about 3 miles in. Unexpectedly, the small flat area that was our only option for camping did not meet LNT guidelines being too close to the trail and water. 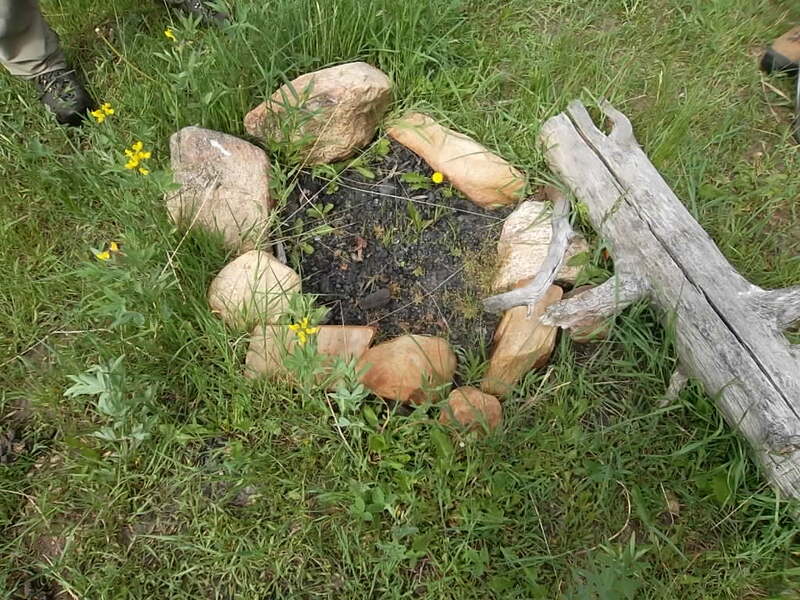 We found a fire ring in the middle of a meadow so Des taught the crew how to tear it down, sift through dirt for micro-trash and rehab the area. We decided to hike out at the end of our day, and return the next when Geoff had planned to join us for work. 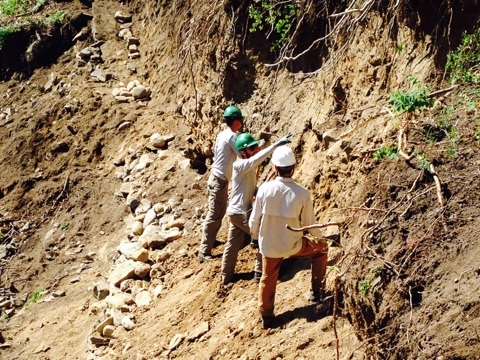 Together, we completed three rock wall projects, a total of about 30 ft placed to prevent further erosion of the steep trail. The next two days were spent on the upper portion of the McIntyre Trail where we ran into some pretty beat up sections. The McIntyre Trail is heavily used by horse travelers seeking to reach the Continental Divide at Ute Pass. With at least 700 ft of muddy sections in need of turnpikes and 300 ft of washed out/rooted tread we were unable to complete large projects, given we were only on a two day hitch and were not aware of it’s rough condition. 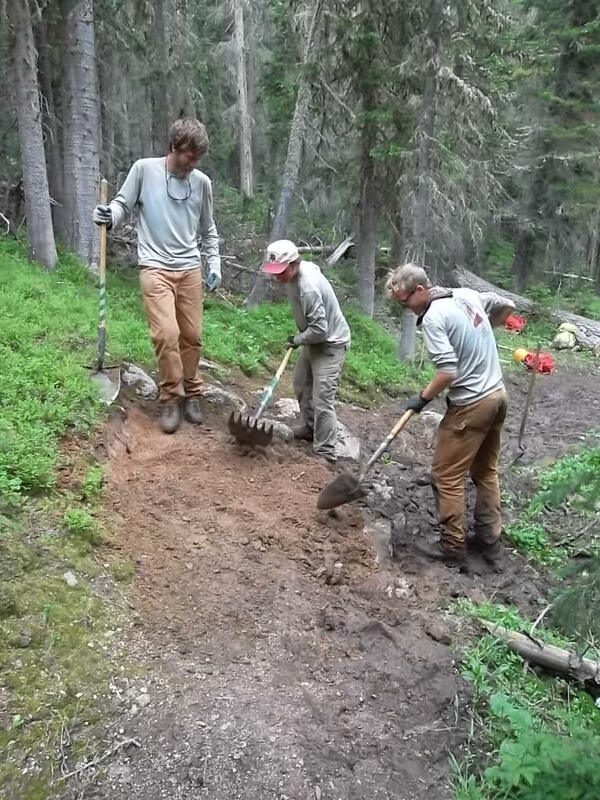 We decided that a general maintenance run would suffice for now (clearing trees/drains and removing berm) but we would hopefully return to the trail later in the season, or next summer’s Rawah crew would be able to return to the project sites. Left with some time at the end of our hitch, we started a 20 ft rock wall section, re-establishing 60 ft of widened, muddy trail. Monday, Wednesday and Thursday brought the Kawuneeche Crew back up to the mess hall at Lake Irene, where we were able to finish 3/4 of the roof with hand-laid cedar shingles. In roofer’s terms, the roof is a little less than 12 squares (one square=100 square feet). In layman’s terms, it’s a pretty medium sized roof for a 3 room building, and the light purple chalk lines complement the orange tinged shingles quite nicely. 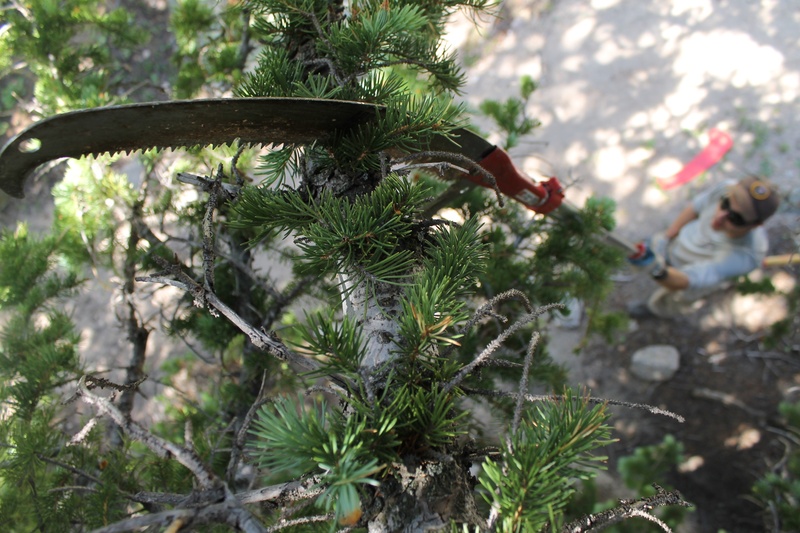 Tuesday the crew drove over Trail Ridge into Estes Park to join the projects crew and the buildings maintenance crew for a scaffolding training, useful information for when we have to set up the second half of our scaffolding on the barn! Thursday was also a half day for the NPS, so the crew were sent on a hike for the afternoon, up to gorgeous Milner Pass. A great way to start the holiday weekend! Happy Fourth of July from the Kawuneeche crew! 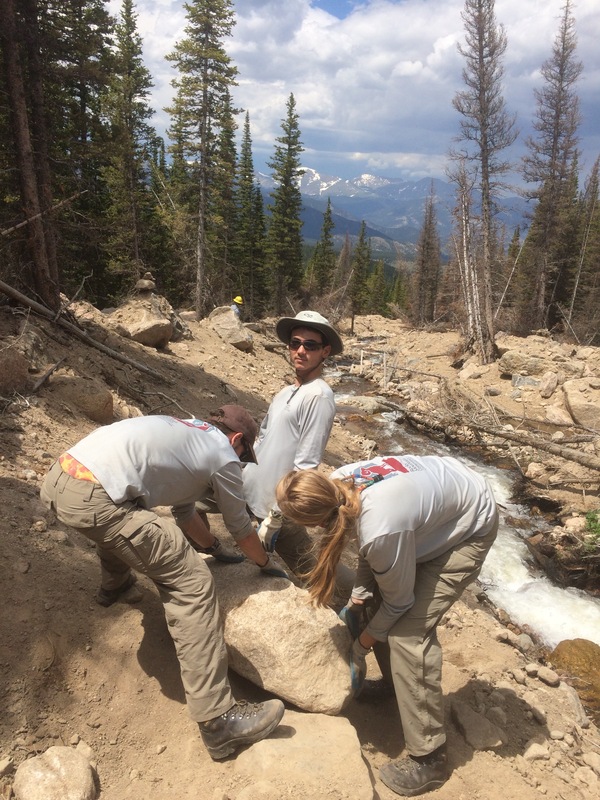 Continuing work with the Rocky Mountain National Park Trail’s crews, the Estes Crew began this week with trail maintenance runs around the Park. By this time in the season, the populated trails have already been completed, leaving this week to improve and explore the Park’s nooks and crannies. 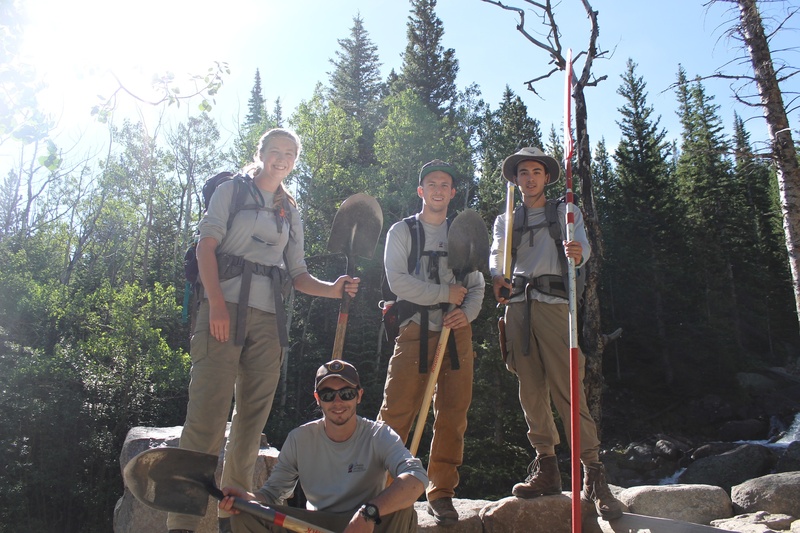 They completed over 14 miles of trail work including North Longs Trail and Hollowell Park. The remainder of the week was dedicated to projects. 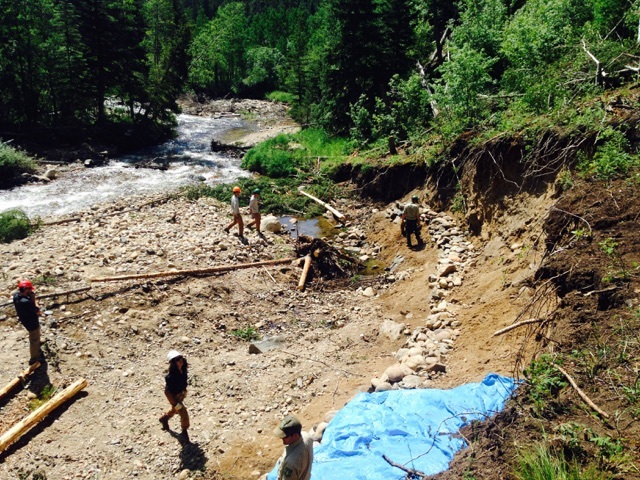 Building the bridge at Boulder Brook was an insightful experience to share. Almost all of the bridge materials are gathered on site. 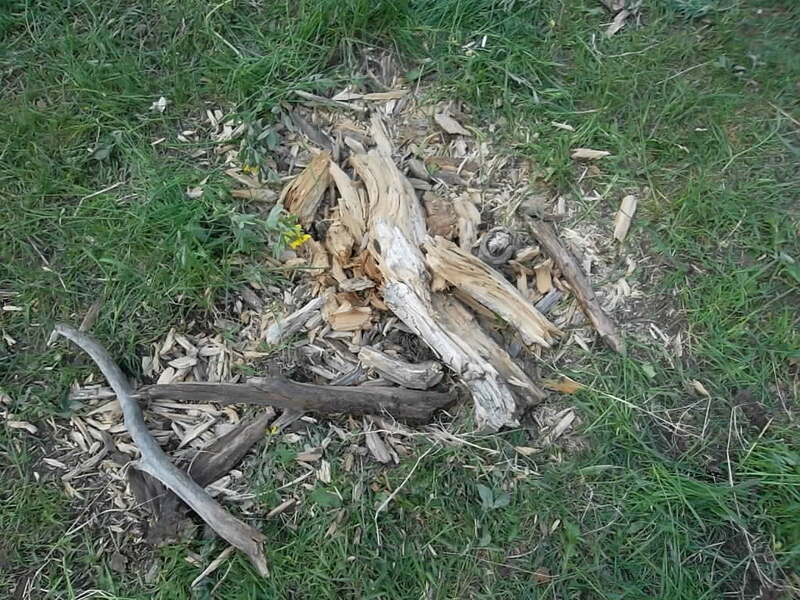 Logs that once clogged the trail were cut and debarked. Boulders for the rock wall are collected from the river bank. 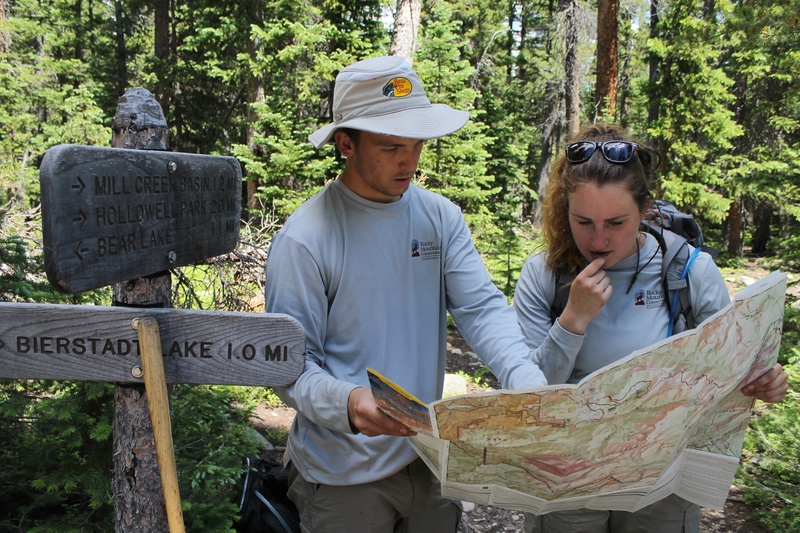 Among the many miles and hard work, the Estes Crew is learning about land ethics. Teamwork. The larger the project, the more teamwork is needed. 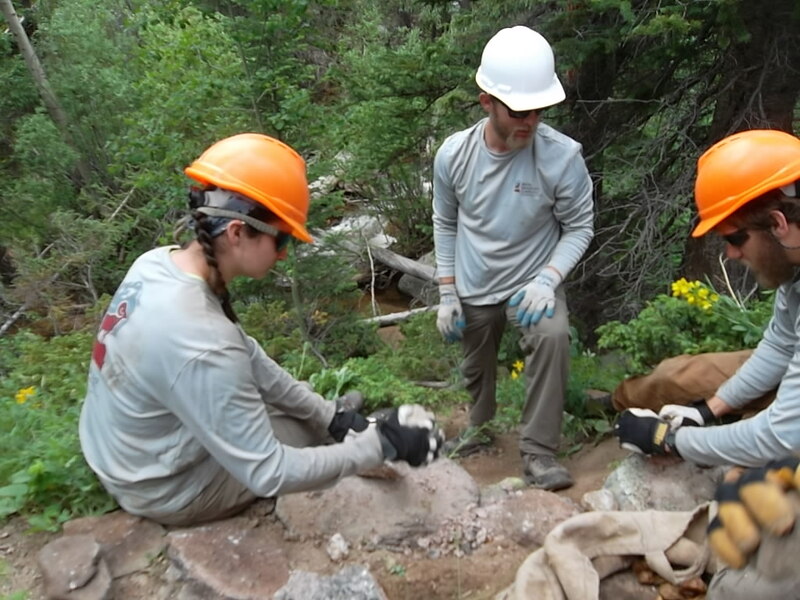 This past week the Red Feather Crew collaborated with the Forest Service and the Larimer County Conservation Corps on the North Fork Trail. This was different from the past few weeks because instead of just the six of us there were now 15 in the project. This was necessary for the massive re-route that was going to be under taken. The re-route was intended as a method of flood relief, as the trail has been closed for two years now. 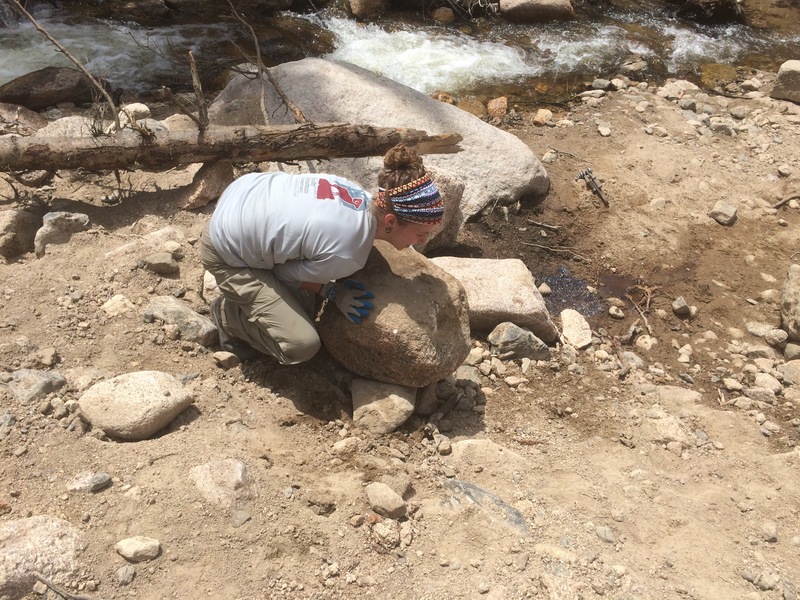 The goal was to re direct the Big Thompson river away from where the edge of the new trail would be and then re-establish a trail for this popular hiking area. In order to perform this rocks and fallen trees were pushed along the river, this was necessary to move the river to a safe area for people as well as the trail. Once this has been achieved, a retaining wall was developed that turned out to be around 12 feet. 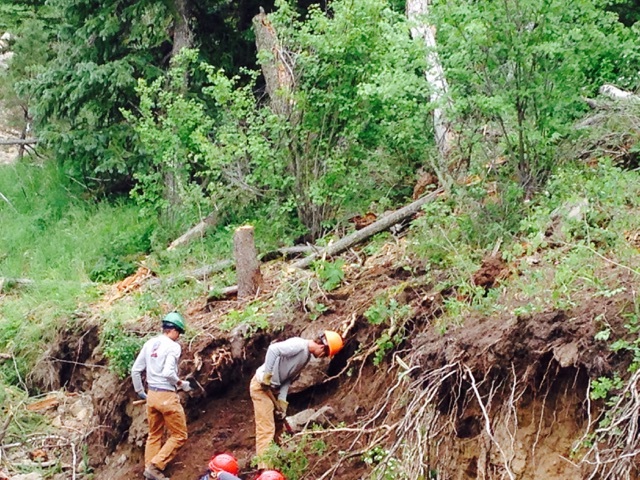 To insure stability of the wall, we made sure there was no organic, or loose materials around the trail. With collective efforts we were able to finally cut out the new trail that would be as to be used by other people and stock alike. 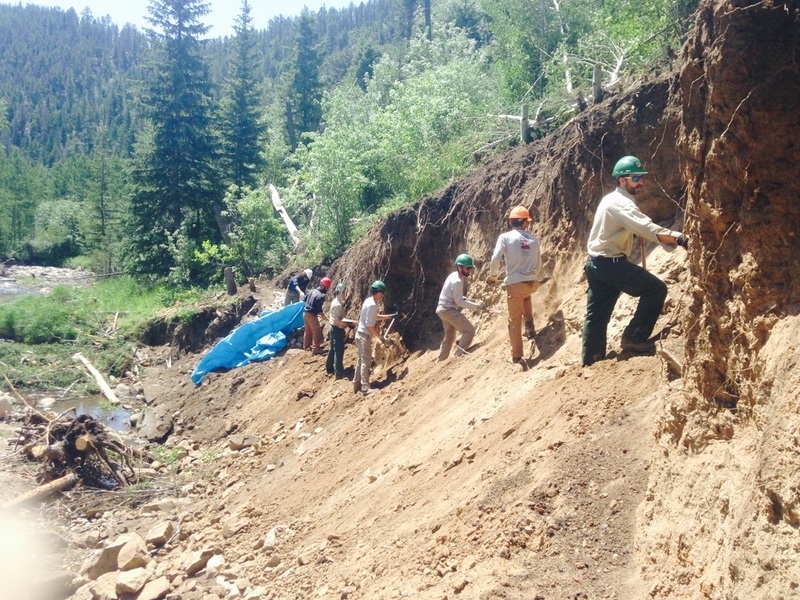 This was a huge project and without the collaboration of the LCCC, RMC-CC, and the Forest Service we would not be able to have triumphed over the North Fork trail re-route.